Blackpool manager Ian Holloway has confirmed Southend midfielder Ryan Hall has trained with the club with a view to a possible move to Bloomfield Road. Holloway told BBC Radio Lancashire that Hall and QPR striker DJ Campbell almost signed before the transfer deadline. "We could do them on loan with a view to any sort of deals," he said. "They were things that nearly happened and they might happen in the very near future. I've had one of the lads training with us and he did very well." Holloway continued: "It's all about the timing of it. I don't want people coming in and missing the Christmas period or not being able to go through until January." Speaking last month, Holloway had said the chances of Campbell rejoining Blackpool were remote because of the finances involved in any possible transfer. Hall, 24, scored 23 goals in 105 appearances for the Shrimpers, including 14 last season as Southend reached the League Two play-offs. 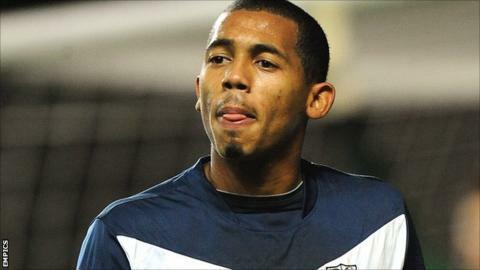 But last week, Southend manager Paul Sturrock indicated he would be willing to let the player leave Roots Hall. Sturrock told BBC Essex he did not think Hall was "mentally attuned" to play. Hall tweeted a picture from inside Bloomfield Road on Thursday morning, alongside the message: "Hopefully today is a prosperous day! #PositiveThoughts." And Holloway has said he is not in favour of players using social networking sites. "I don't like it and it will get players into trouble. It has and it will," added Holloway. "I'd be very careful if I was a player. "Obviously Ryan's not my player yet, and if and when he is for definite, we'll let people know about it properly and professionally. "As far as I'm concerned, good luck to people who enjoy that [social networking] but it's another modern thing that I can't stand."